What a fun story! I've enjoyed Skye's Leven Thumps series, so I was happy to be given a chance to read this book. As is customary in this house, as soon as my children saw the book, they absconded with it and I didn't see it again for several weeks. The book would probably still be in that great zone of destruction also known as their bedroom, but since I had yet to read it, I risked life and limb to enter that area and rescue it. I'm glad I did. I was caught up in the story almost immediately, and it was difficult to put it down. Ozzy is quite the resourceful teenager, but I think Clark was probably my favorite character. To be honest, Rin kinda got on my nerves after awhile, but he redeemed himself later on in the book. My favorite thing about Wizard for Hire is the characters-how funny they are. I think my favorite characters are either the wizard or Clark. The reason I like the wizard is because he is really funny and loves breakfast. Clark is really serious but sometimes he can be a really dumb because he has a crush on anything metal like the trash can at McDonald's. I also really like the story. One of my son's told me the other day that he's a cover snob. I was trying to get him to read A Wrinkle in Time since that was my favorite book growing up, but I'll admit that the cover does nothing for the book. Seeing the cover of Wizard for Hire I wouldn't have any problems getting him to read this story. It's fun and it's engaging. Actually, it's a lot like the book itself. Because it's Middle Grade Fantasy I give it a lot more leeway than I normally would. Sometimes it just didn't really seem to flow, but I'm positive my kids wouldn't notice that or have a problem with it. I think my favorite parts in the story were when Ozzy went to school. I'm a little sad that didn't last as long as I wanted, but I loved his enthusiasm for the food, and even for his classes. I like that he didn't let what the other kids say bother him, and I like that there was at least one nice kid in the school to befriend him. I actually really enjoyed that the whole novel I was wondering whether or not Rin was really a wizard. I kept going back and forth, is he or isn't he? At times I felt for sure he wasn't, and other times I thought, well, maybe he is. 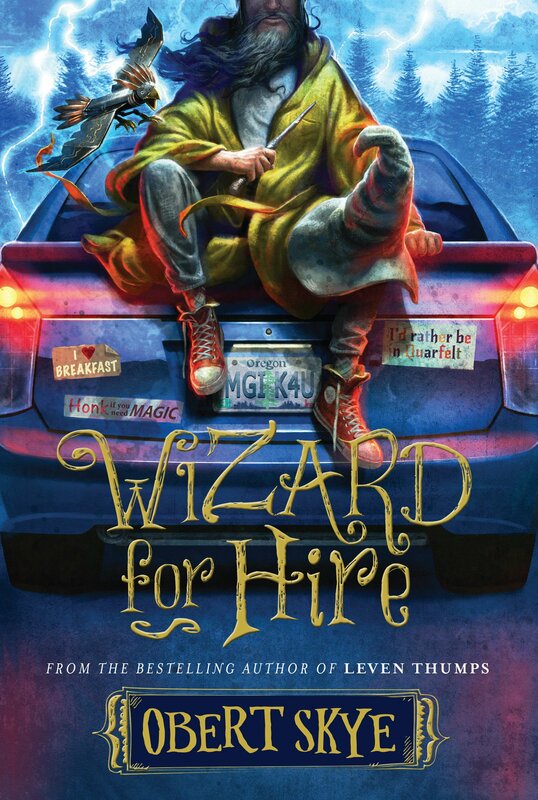 I haven't been reading much YA (or actually maybe Wizard for Hire would be considered Middle Grade), but it's nice to get into books in this genre for a quick and entertaining read. Wizard for Hire is well-written, and although it's just over 400 pages, it really doesn't take too long to read. There's quite a bit of humor, and especially for a book geared toward a younger audience, I appreciated that that aspect takes away from the grief and pain associated with Ozzy's situation. I wasn't sure what to make of Rin for the entire book. I was left with plenty of questions about him at the end, but he did seem to actually be helping Ozzy at that point instead of just in it for the free food and gas money. Ozzy had his main question answered, and although it wasn't what I'd hoped for him (at the end I was still wishing there was a mistake), it does seem like he's in for a happy ending. I'm very curious to see what comes next for Ozzy and Rin.